Mayor Rahm Emanuel pledged to supporters at his election party Tuesday night that “we will get back out there” as he prepares for a runoff against Cook County Commissioner Jesus “Chuy” Garcia on April 7. Emanuel fell short of the majority needed to win outright, resulting in the first time a runoff has been needed to decide the Chicago mayoral election. 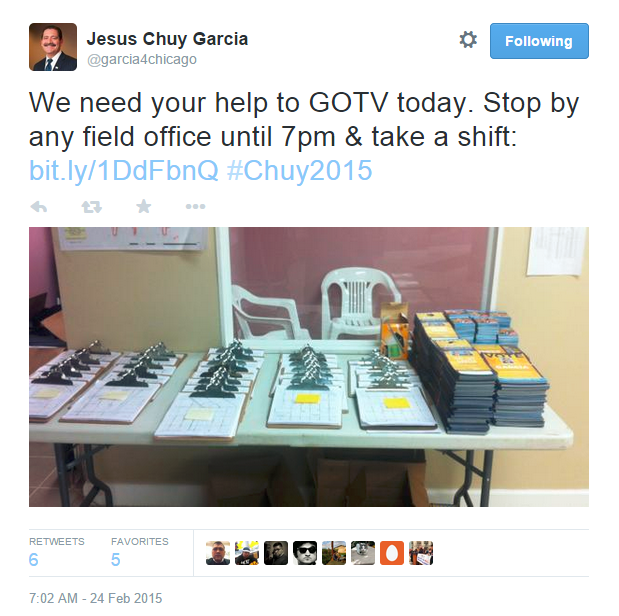 Garcia gathered 34 percent to force the runoff. Willie Wilson received nearly 11 percent of the vote, followed by Ald. Bob Fioretti with 7 percent and William “Dock” Walls with 3 percent. Voter turnout hovered around 33 percent of registered voters, down from the 2011 mayoral campaign. 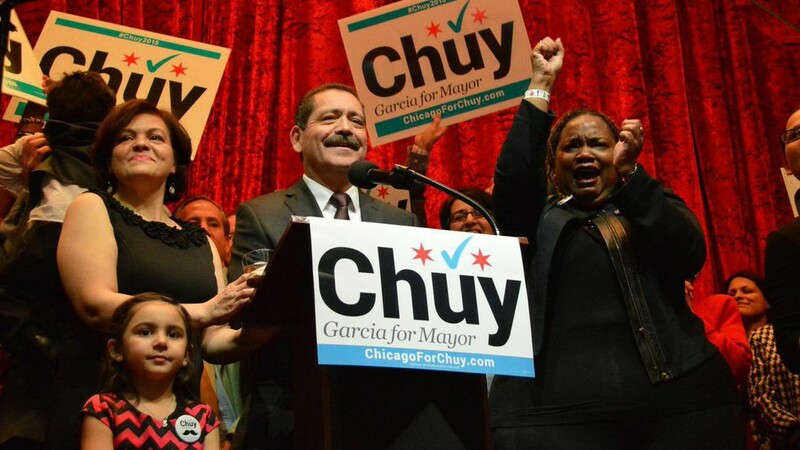 Garcia surpassed projections from a Feb. 17 Chicago Tribune poll, which had him getting only 20 percent of the vote. Over the past week, as 90,000 Chicagoans took advantage of early voting, the five mayoral candidates worked to win over as many last-minute votes as they could, particularly from African-American communities, which were key to determining the results. The four other mayoral candidates, Garcia, Fioretti, Wilson and perennial candidate Walls, attacked the incumbent mayor’s controversial record from his first term. 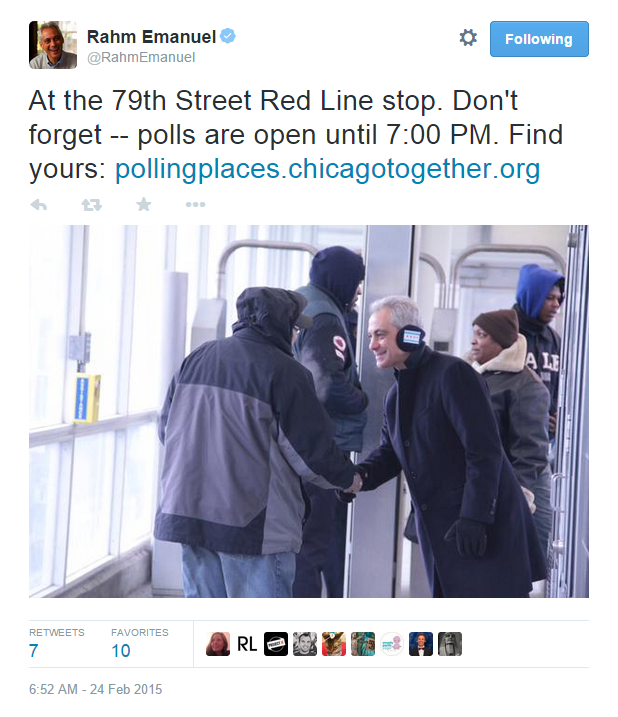 Emanuel needed only to win over a portion of the undecided voters to win a majority, and his challengers were trying to prevent that by pointing to some of the mayor’s unpopular decisions from his first term, which include the closing of 50 public schools, predominantly in African-American and Latino neighborhoods, in May of 2013. This morning, candidates tweeted reminders to Get Out the Vote, in hopes of either forcing or thwarting a runoff. Emanuel’s challengers sought to promote the image of an elitist whose policies benefit the wealthy while ignoring the city’s crime ridden and disenfranchised neighborhoods. 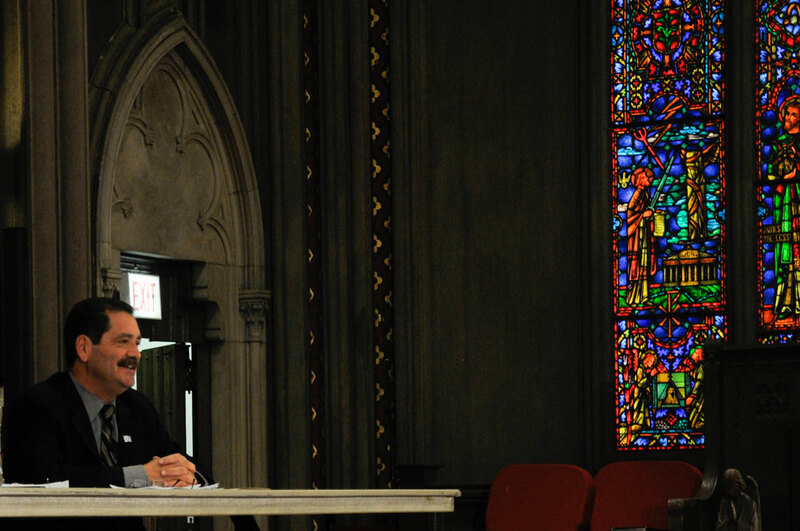 But it is largely due to his wealth and connections that Emanuel’s campaign has been so formidable. Facing low approval ratings in 2014, Emanuel raised $15 million for his campaign, with millions spent on TV advertisements alone. President Barack Obama heaped praise on the mayor during a visit to Chicago on Feb. 19 in an effort to bolster support from African-American voters, one fourth of whom were still undecided according to the Chicago Tribune poll. 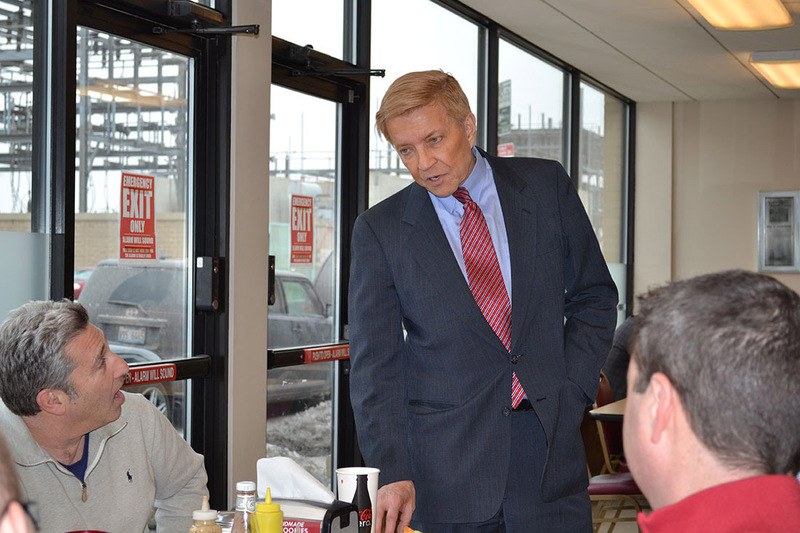 Fioretti spent the day out and about doing some last-minute campaigning and meeting voters. He stopped for lunch at Manny’s Deli on the Near West Side, where he expressed optimism about his chances in the race. The alderman also discussed the differences between running a campaign within a ward and running in a citywide election. Early this morning Wilson called for an investigation into possible errors at polling places. Addressing a crowd of reporters at about 8 a.m. in front of the Board of Election Commissioners in the Loop, he said he had gotten word that a few machines were malfunctioning so that a vote for him appeared as a vote for Emanuel. He also said that he had heard reports of polling places that had not yet opened, and that his attorneys were looking into the issue. 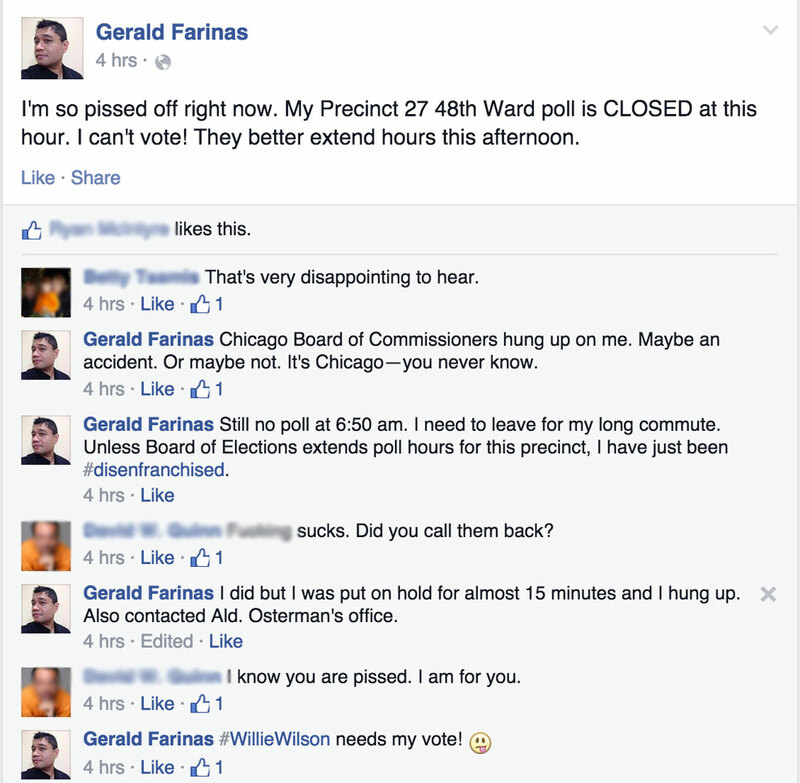 Wilson’s concerns were echoed by Gerald Farinas who wrote on Facebook that his polling place in the 48th Ward was closed. 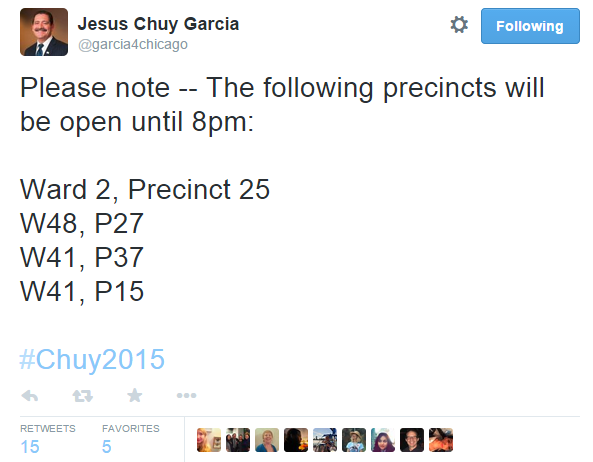 Early this afternoon, Garcia tweeted that several polling places would be open until 8 p.m., instead of 7 p.m. as originally planned. Among the places on his list was Ward 48 Precinct 27, which Farinas mentioned in his Facebook post. Carol Ronen, Democratic Committeewoman of the 48th Ward, said that Precinct 27 opened late and would stay open late as a result. The Chicago Board of Election Commissioners said they are petitioning to keep some polls open late but did not specify which ones.